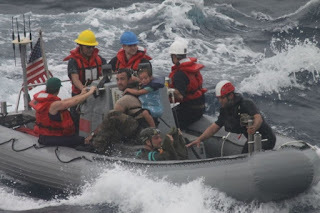 "Family Defends Taking Infant to Sea..."
Most of you have probably heard the story of the family of four who was rescued 900 miles off the Mexican coast by the US Navy. The Kaufman family was shortly into a trans-Pacific voyage in their small sailboat Rebel Heart when their one year old child began showing signs of salmonella poisoning. Also mentioned is that their sailboat had lost steering or communication abilities. I am guessing that they activated their EPIRB, a satellite distress signal that almost all cruising sailors carry. The US Coast Guard, US Navy, and California Air National Guard carried out a rescue, and then sunk the sailboat (which is common practice so as not to leave a navigation hazard). (See article here). This story hits close to home for us for obvious reasons. What surprises me more than the family’s troubles and rescue is the highly-charged reactions to the event and against the parents. The articles published so far do not explain what happened to their communication and steering, and they do not provide enough details to determine whether the parents were well-prepared for the voyage, whether they used good judgment leading up to this situation, whether the boat was well-found, etc., so making judgments in those areas is premature. Despite this lack of facts, many commenters have already judged the parents harshly in those areas. astounding." And "foolish pride is what put them out there to begin with." And "you and many other small boat and plane owners are supreme egotists who last words might routinely be ‘this can't be happening.’ "
Most of these comments reveal the commenters’ ignorance of the real risks of cruising. This one’s my favorite: "Kaufman's planned voyage was almost a death wish, as are all long ocean voyages sailing short-handed in small sail boats." Let me state here that I do not have a death wish. I do not have formal statistics on cruising risks to compare to the risks of a more conventional life, but what I do know is that there are many thousands of small boats cruising the world's oceans these days. There are many boats that have cruised for years with kids on board, and the majority of them have done so without ever finding themselves in a situation that they could not handle. Cruising a small boat on the ocean is far from risk-free, but many of the risks are manageable ones that can be mitigated with preparation of the crew, preparation of the boat, and attention to weather forecasts and other details. So why the uproar over these parents? Our culture seems to have arrived at the view that kids must be shielded from any risk whatsoever. We believe that this attitude is not only overkill but actually works against raising healthy children. 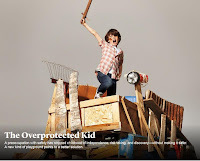 Not only do those efforts create an illusion of safety, but they actually diminish a child's ability to overcome future obstacles he or she will encounter. We all want our children to become independent, resilient adults, but those are qualities that cannot really be taught; they must be learned by experience. Some exposure to risk and difficulty are the only way to gain the skills to tackle all that life will bring. Any parent my age has reminisced about the things we did when we were young. Crazy stuff. Definitely unsupervised stuff. Most of us turned out pretty well. Why aren’t more of us dead? Were we just lucky? All of us? Sure, things are different now, but not in the ways that many people think; statistically, most of life is actually safer than it was in the old days. What has changed is the attitudes of parents, school administrators, law enforcement, and others about the amount of risk kids should be exposed to. (On this topic there's an interesting recent article at the Atlantic Monthly linked at right). Insert cotton plug, keep on wrestling. I'm not advocating taking needless risks, and I certainly don't let my kids do whatever they want. We all wear seatbelts when in the car for example. But often there's a cost to reducing risk, so the decisions become a risk vs reward calculation. 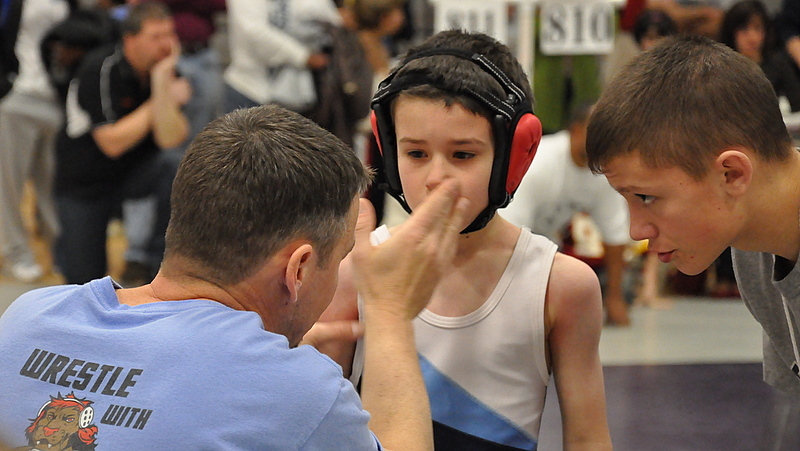 Some people thought we were nuts for letting our son wrestle, but we decided this was a sport that was well worth the potential risks. Had he wanted to take up football, I might have discouraged him, but I certainly don't condemn any parents who come down on the other side of that decision. There are many great ways to raise kids, and I don't have a monopoly on good parenting. Back to sailing - the sailors I've met with kids typically spend a huge amount of time educating them on the right way to do things and then letting them take supervised, incremental risks. And on a boat, the rules and best practices aren't trivial or hyper-restrictive organizational CYA rules but rather exist for safety reasons that are usually pretty apparent or easily explainable. And it's amazing how quickly boat kids rise to that level of seriousness and responsibility. So those commenters who think those Kaufman kids would be better in a foster home? Wow - that just blows my mind. Hey Greg...good post...thought your fellow Mason 43 sailors on MOMO also have an interesting perspective after 12 years aboard http://svmomo.blogspot.com/ . Keep living the good life on your own terms. I too have followed the blog for a couple of years and do not hold it against anyone who wishes to follow their dreams. I will never condemn anyone for a chosen lifestyle. Unfortunately the life style we, and others, have chosen comes into question when something of this magnitude happens. The decision to sail RTW with young children aboard has now become a fiercely debated topic. Now doubt this will continue for some time. I wish to express my deepest gratitude to all the members of the rescue teams. It makes me proud to be an American tax payer when I witness men jumping out of a plane into the ocean to go, without question or regard of their own safety, to the aid of a young child. As fellow sailors we are all obligated to help a vessel in distress. I would never question having to go to the aid of another vessel. I am certain Eric and Charlotte would have sailed miles to assist another sailor. Unfortunately, it was them needing the support. I am gratified they had the necessary equipment aboard to communicate their dire needs. When an event like this happens and everybody comes out unscathed, all the people involved did everything right.